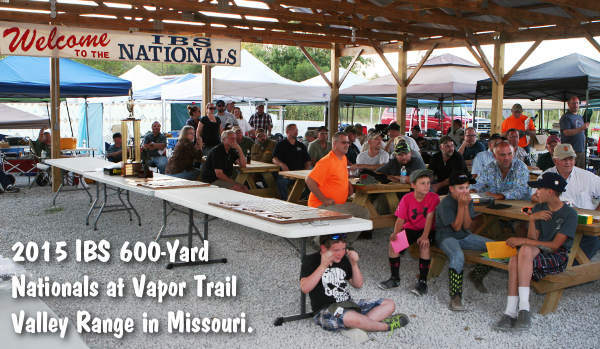 “What a wonderful match” — those words were heard often during this year’s IBS 600-yard National Championship match. 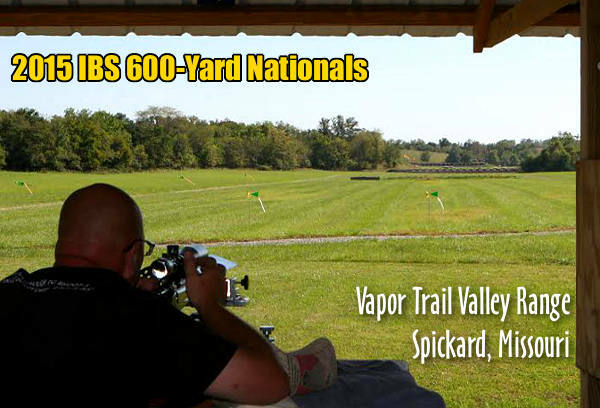 Tom and Sara Jacobs hosted the 600-yard Nationals September 26-27 at their Vapor Trail Valley Range in Spickard, Missouri. 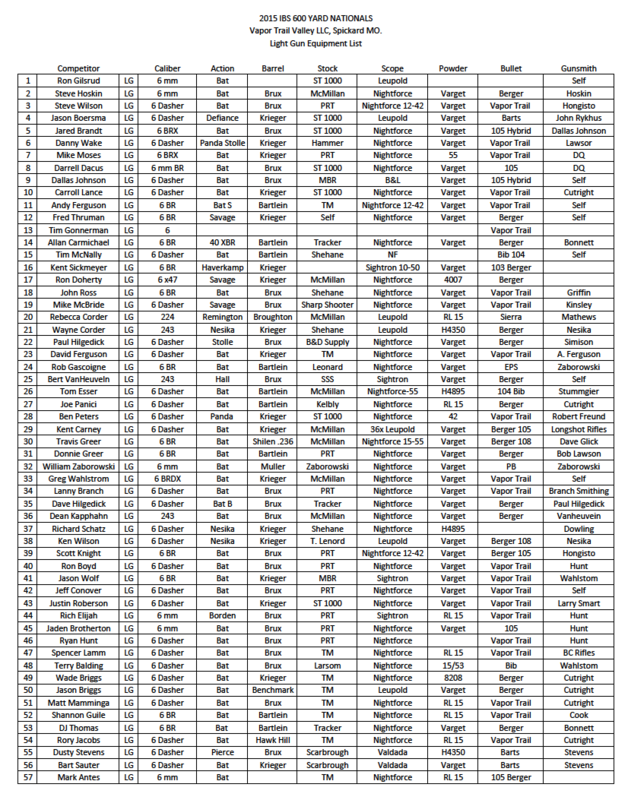 Attendance was strong, with 78 competitors from 14 different states. 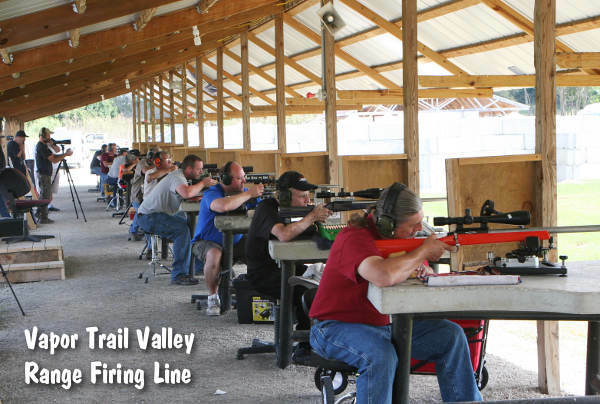 The Vapor Trail Valley range holds both 600-yard and 1000-yard yard matches throughout the year. Located in northwest Missouri, Vapor Trail Valley sits in the middle of crop ground and cattle country. The terrain is a mixture of tree lines and green pastures. It seemed every aspect of the match came off flawlessly, thanks to the hard work of the organizers. Even the weather cooperated, with 80 degree days and 60 degree mornings. The wind was mild but twitchy, providing a challenge for the competitors. Overall though, conditions were generally good and some very impressive results were recorded. 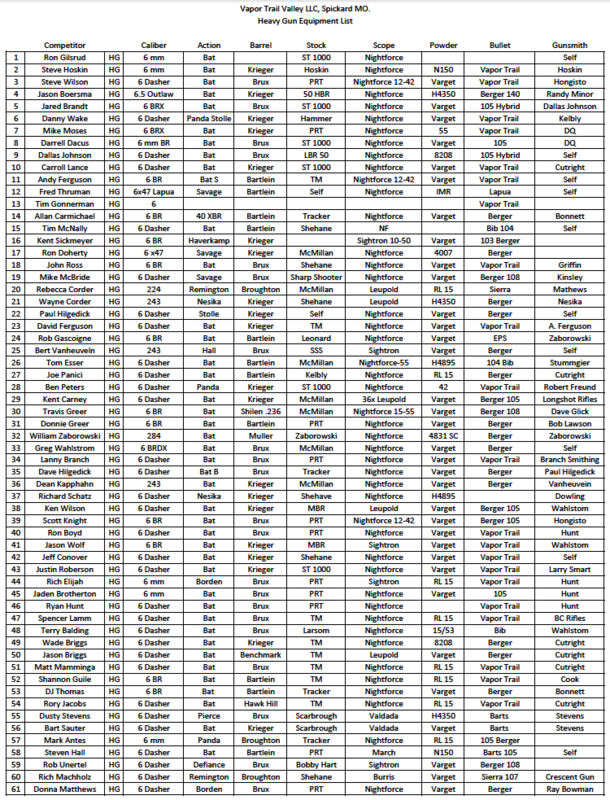 Despite the twitchy winds, over the course of the weekend, some eighty perfect 50-point targets were shot. That’s darn good shooting overall. 1. Competition is VERY tight now. The difference between 1st place and 20th place in Light Gun Group Aggregate was .478″, less than half an inch. The difference between 1st and 20th place in Heavy Gun Group aggregate was .480″, again less than half an inch. 2. 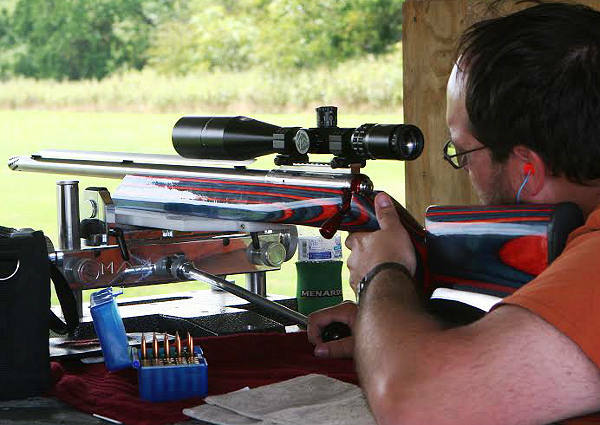 6mm cartridges, particularly the 6mmBR and Dasher, now dominate the 600-yard Benchrest game. All but one Light Gun was chambered as a 6mm, mostly 6BRs or Dashers. Even in the Heavy Gun division, 6mms ruled — 58 out of 61 Heavy Guns were chambered for 6mm cartridges, mostly Dashers. 3. These rigs are capable of extreme accuracy. The ten best Light Gun groups were all under 1.250″ (FYI, at 600 yards, one-quarter-MOA is 1.570″). And, as you can see at right, the three smallest Light Gun Groups were all under 0.9″. Think about that — a one-inch group used to be considered darn good at 300 yards. This photo shows the winners in the front row, kneeling. Left to right are: Bud Larson (HG Score), Richard Schatz (2 Gun Overall, HG Group) , and Jim Bauer (HG Overall). After Friday practice, the match began with the Light Gun relays on Saturday. Both Light and Heavy Guns shoot 8-target Aggregates. At the end of the day Saturday, Tim Gonnerman was the Light Gun Group winner with a 2.236 Agg , edging runner-up Jason Walker by a mere .003″. That’s about as close as it gets. Dan Hullinger won Light Gun Score with a 382 (Danny Wake also had a 382 but placed second on the tie-breaker). Richard Schatz, “Mr. Consistent”, placed 4th for score and 5th for group to take the Light Gun Overall title. Last year’s two gun Champion Ryan Hunt finished in second place. If you review the equipment list for the Top 20 Two Gun competitors, you’ll find that Nightforce scopes were used by 19 shooters, while BAT actions were used by 15 shooters. Remarkably, 17 out of the top 20 used rifles chambered in 6 Dasher. Hodgdon Varget was the most commonly-used powder followed by Alliant Reloder 15. In the barrel department, Brux enjoyed a slight edge over Krieger, with ten shooters using Brux Barrels vs. seven using Kriegers. Note the large, extended-width base-plate under the forearm. This spreads the load and provides more stability when used with super-wide SEB MAX front rest. The Heavy Guns came out on Sunday. Early morning relays saw a dead-flat wind condition that constantly changed as the day progressed. Scores settled a little and groups opened up, creating a little room between competitors. In the end, Bud Larson won the Heavy Gun Score title with a 385 total. This year’s Shooter of the Year leader Andy Ferguson was close behind with a 384. The Heavy Gun group champion is Richard Schatz with a 2.003 Agg, followed by Jim Bauer with a 2.017. The Heavy Gun overall went to Jim Bauer followed by “Andy Who?” Ferguson (see photo below). 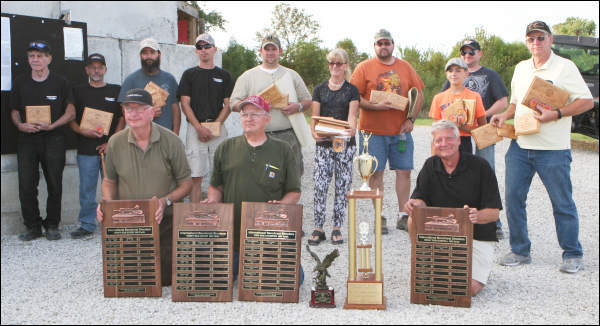 The 2015 IBS 600-yard Two Gun Champion is Richard Schatz with 18 rank points. If you look at the new 600-yard traveling trophies, you’ll see Mr. Schatz’s name multiple times — this victory marks the third time Richard has won the 600-yard, Two Gun IBS National Championship in the past decade. Richard Schatz is certainly a great ambassador for our sport and a true gentleman. Second Place in the Two Gun overall went to Jim Bauer, not far behind with 20 rank points. Taking third was Andy Ferguson with 28 rank points. 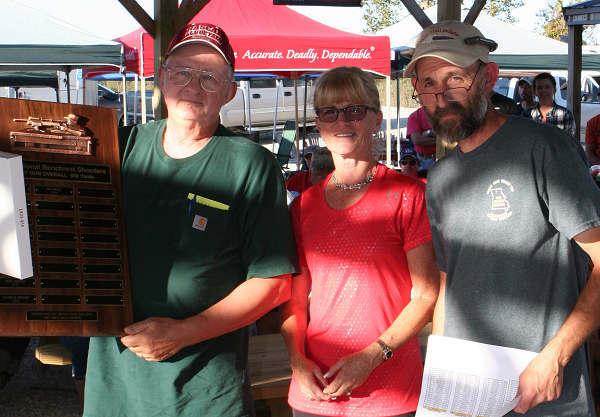 Left to right are Two Gun Overall winner Richard Schatz, along with top female Shooter, Sally Bauer and Tom Jacobs, Vapor Trail Valley range owner. The top lady shooter was Sally Bauer. A past IBS 1000-yard Shooter of the Year, Sally is a 7-time female National Champion in 600-yard or 1000-yard benchrest. 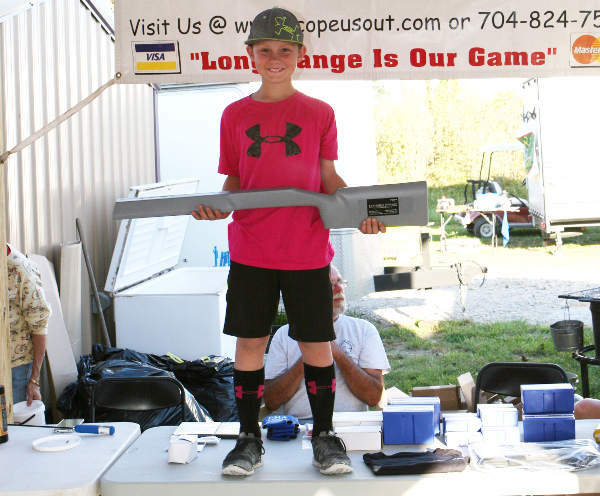 Rory Jacobs was the Junior “Top Gun” this year, winning the Junior division and finishing 10th Overall among ALL shooters (of any age) in the Two-Gun Agg. Rory is a four-time Junior National Champion and three-time Junior shooter of the year. The top Rookie shooter was Carroll Lance. As with many of the matches that we attend, the range owner’s family and friends make up the help for scoring and target crews, the lunch attendants and general maintenance of the ongoing match. This match is no different. Tom and Sara’s families took care of all the required chores and it all came together like a well-oiled machine. Give credit to Tom Jacobs for working with the sponsors to put together a great prize table — every shooter in attendance got a sponsored prize. Please take the time to let our sponsors know that you appreciate their generous support. Here’s the “Andy Who?” story. 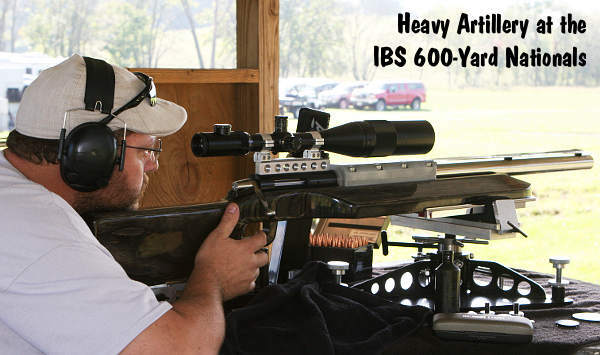 Andy Ferguson, a good friend and neighbor of the Vapor Trail Valley range owners, is currently leading the 600-yard Shooter of the Year (SOY) point competition. Given his hot shooting and top ranking in the SOY chase, some of Andy’s friends/fellow competitors thought Andy might be getting a “big head” (i.e. oversize ego). 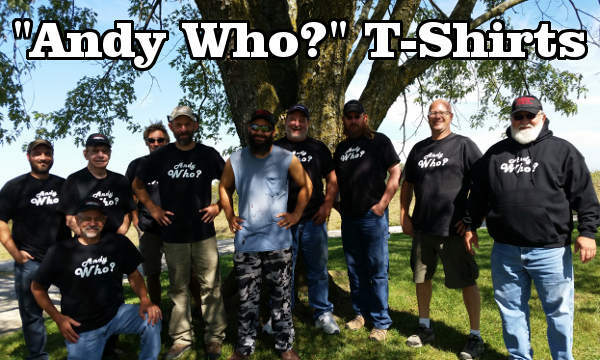 To bring him down to earth, as a joke, Andy’s friends printed up the “Andy Who?” T shirts. A good laugh was had by all. Share the post "Match Report: IBS 2015 600-Yard National Championship"